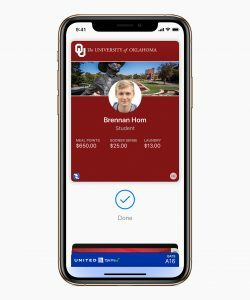 Access control solutions provider, ASSA ABLOY, is presenting a free webinar discussing how Apple Wallet is enabling the University of Oklahoma to increase convenience and security on campus by issuing mobile credentials to students. Registration is now open for the webinar, scheduled for Wednesday, February 27th from 2:00PM – 3:00PM EST. In the “Increase Security with Mobile Student IDs” webinar, Tyler Webb, Director of the Sooner Card at the University of Oklahoma will detail the university’s journey from traditional access control to mobile student IDs. Attendees will learn how adding Sooner Cards to Apple Wallet has made Oklahoma’s campus more convenient and more secure than ever before. CR80News caught up with Oklahoma’s Tyler Webb ahead of the webinar event to discuss how mobile credentials are changing the ID landscape on Oklahoma’s campus. The webinar is intended to shed light on Oklahoma’s implementation process with Mobile Credential with the hopes that attendees can benefit from the lessons learned. University of Oklahoma Mobile Credential in Apple Wallet. The University of Oklahoma was one of the three launch campuses to use mobile credentials announced on October 18. Key to Oklahoma’s deployment was its longstanding technical migration to NFC capable hardware. “We had been working toward this since 2013, hoping that the day the mobile student ID solution would arrive,” says Webb. Since just its October launch Webb says that Oklahoma has seen more than 50% of its on-campus, residential students opt to be issued a Mobile Credential. ASSA ABLOY is one of the access control manufacturers whose hardware is fully compatible with Oklahoma’s Mobile Credential. All three launch institutions for Mobile Credential are using locks from ASSA ABLOY. For the first time since the solution went live on campus last October, we can now learn more about the access control side of the system, and how Mobile Credential is breathing new life into the student transaction experience. For more, register and tune in for ASSA ABLOY’s free webinar detailing Mobile Credential with the University of Oklahoma.